What's that, you say? It's National Novel Writing Month. 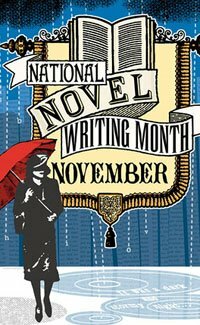 Now in it’s 8th year, NaNoWriMo unites people all over the world in the common goal of banging out a 50,000-word first draft by the end of November, with online pep talks, daily word counts and group critique sessions. And next month I'll be one of 'em. I've got a novel idea that's been languishing unattended. Why is there something vaguely embarassing about admitting you're writing a novel? Maybe I've been in journalism for too long. Every time I decide to devote more time to it, a chunk of work comes up that I just can't say no to. So it's time for drastic measures, and NaNoWriMo came at the right time. I'm cutting sharply down on work and cooling it on the blogging, so The Manchizzle will be quieter for a while, though I'll still check in once a week. I'm trying to heed the warnings of Clare and other writers for whom blogging is a tempting source of procrastination. Here's a great Slate article by one of my favorite writers, Sarah Hepola, explaining why she decommissioned her blog so she could write a novel. Anyone else around here participating, besides Keris? If so, add me as a buddy - I'm yankunian. And if you're curious, come on down to a meeting of local Wrimos this Saturday at Kro Piccadilly, from 2:30 to 5ish. There's a whopping 270 writers affiliated with the Manchester regional group.